What Happened to Trump’s Favorite Blacks? During his run to the White House, President Donald Trump seemed to have an endless supply of African-American supporters whom he could rush out to sing his praises. There was the B.A.P.S-like duo of Diamond and Silk and the greasy-headed preacher Darrell Scott. And there was 2017’s real-life Stephen from Django: Milwaukee County Sheriff David Clarke, who seemed to hate everything even remotely uplifting and black. And who could forget talking head Katrina Pierson, who was the black Kellyanne Conway before we knew who Kellyanne Conway was. Since he took office, it appears that, like many of Trump’s campaign promises, his favorite blacks have disappeared. So we’ve decided to take a look at what happened to some of them and see what they’ve been up to since the devil’s apocalypse took office. Pierson was like 1995 Puff Daddy—the Puffy that Suge Knight hated—because she was “all up in the videos.” When Trump was running for office, it was Pierson who proved to be not only one of his biggest supporters but also one of his staunchest defenders. It was reported that during Sean Spicer’s (we miss you, Spicy Facts!) tenure, Pierson was offered the deputy press secretary post but turned it down believing that she could be more effective outside the White House. Pierson now works for a nonprofit launched by Trump allies called America First Policies, which includes several Trump campaign veterans, The Hill reports. Sarah Huckabee Sanders would ultimately become the deputy press secretary, but let’s just take a second and think about the dream team that Spicy Facts and Pierson could’ve been. White America has always had a hard-on for blacks who believe other blacks just need to work harder, stop complaining and pull themselves up and blah, blah. ... Blacks have a name for these blacks as well, and while that name isn’t fit to print, let’s just say that Clarke moved himself up Trump’s “likable blacks ladder” by being tough on blacks. He likened the Black Lives Matter movement to terrorism and went nuts on Don Lemon during a segment on BLM. In the end, Clarke’s self-hatred was enough to propel him into a potential position in the Department of Homeland Security, except the job stalled after Clarke was accused of plagiarizing his master’s thesis, and it was found that the conditions in his jails left one mentally ill inmate dead. Although the job didn’t appear to be available, Clarke ultimately turned it down. Since then, Clarke seems to be caping for his master, President Donald Von Douche Face, on Twitter. South Carolina pastor Mark Burns had become one of Trump’s go-to opening acts during his campaign rallies and his run to the White House—that is, until it was learned that Burns, much like the president, was a fraud and a huckster. Burns claimed on his church’s website that he had a Bachelor of Science and had served six years in the Army Reserve. CNN found that he was never in the Army Reserve and served only in the National Guard until he was discharged in 2008. And not only did Burns not have a bachelor’s from North Greenville University—he’d attended the school for only one semester. Burns copped to his lies, claiming that he started his church as a young man and embellished his résumé so that he could be taken seriously. He also lied about being a member of the Kappa Alpha Psi fraternity. Honestly, if you’re having a bad day, just watch the video below, which shows Burns going down in a glorious hail of misery and lies. It looks as if Burns has taken his sideshow to social media since being exposed. He’s still riding on the success that he once had from holding the president’s nuts and is using his faux celebrity to shoot videos inside a Paul Mitchell hair salon. Diamond and Silk aren’t deplorables, though they should be. They’re the affable black women who seem as sweet as a Patti LaBelle pie and love Donald Trump the way flies love old picnic food. I see them more as opportunists. Maybe they really love Trump, maybe they don’t—who knows—but the whole bit of them being all blackity-black while loving up president racism feels like a put-on. Since Trump took the White House, Diamond and Silk have taken a back seat, which I’m sure is fine with them. They have become a sideshow attraction, making impassioned speeches at Trump rallies because the president is still rallying. Unlike many of Trump’s favorite blacks, Diamond and Silk were not gifted a position in the White House. But all is not lost. They do have a web store that sells such highly coveted items as a blinged-out Trump pin and a coffee mug with their faces on it. 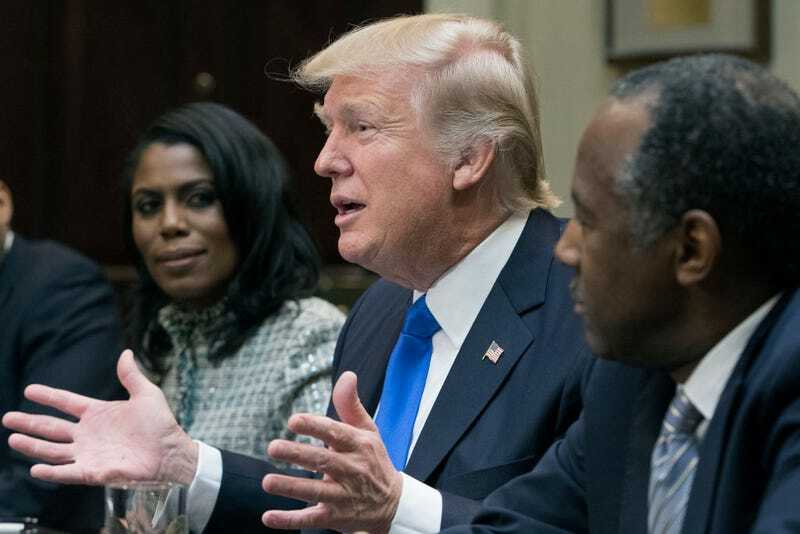 Trump and Omarosa were supposed to be the real Diamond and Silk, except that Trump started balling out, and, well, it’s like Omarosa got spooked and left Harlem to join a church. Da fuq happened to Omarosa?! Right after Trump won, she was out here talking about how Congress members better watch their steps because the administration was keeping a hit list, and now she’s said about as much as Clarence Thomas has since he joined the Supreme Court. I must admit, for someone who has made her bones by being loud and at most times wrong, I’m a little disappointed that Omarosa hasn’t been a more central figure in this dysfunctional administration. Having this Omarosa in the White House is like Bobby Brown joining a cocaine-fueled supergroup with K-Ci, Jo-Jo and any DeBarge, but instead of doing coke and “sanging,” he’s taking quiet naps and reading A Song of Ice and Fire. I’m going to need The Apprentice Omarosa to come back. She’s working in the White House as a political aide and traveling with the president and giving interviews like this. Also, word is that she’s taken to calling herself the “Honorable Omarosa Manigault,” which means that the old Omarosa is still in there—we’re just waiting for her to come all the way out. According to News 5 Cleveland, Scott entered an agreement with the owner to pay weekly installments on the $2 million home and, after six years of living in the residence, had fallen behind on payments. Scott called the lawsuit “fake”—wonder where he got that from. Arguably Trump’s most favorite black, Carson has taken a job in Trump’s Cabinet as the secretary of housing and urban development, a job that he initially claimed to be unqualified to hold. Since taking the position, he has called poverty “a state of mind” and added that Trump’s drama has made it easier to “get stuff done” in his job. Oh, he’s also added that he doesn’t want to make low-income housing too cozy because he doesn’t believe in government assistance being a handout, but rather, a hand up. And yes, folks, this guy is still one of the most decorated neurosurgeons this country has ever known.